« Hospitals here are much better than India! Our last week in Laos was one of the more exciting weeks of our entire trip. 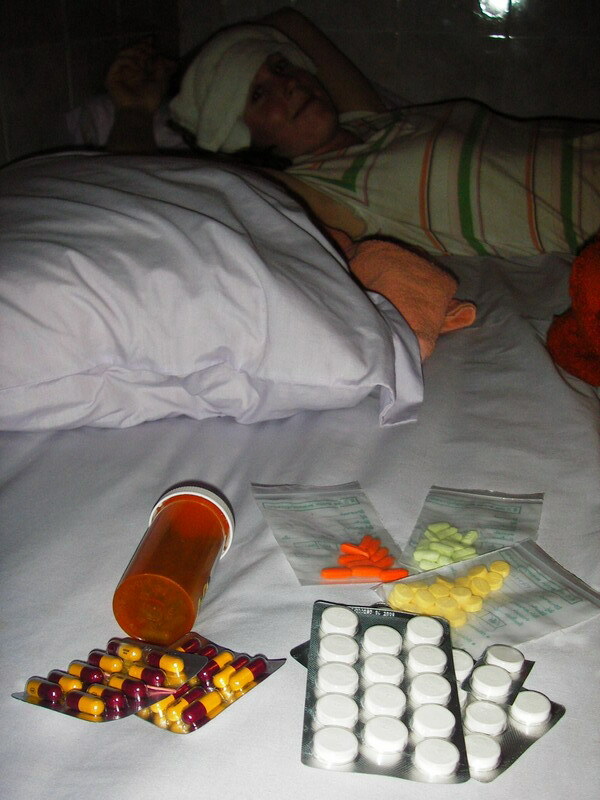 After I got over being sick, no doubt due to one of the cornucopia of pills I took, (see picture below) we spent a few days doing some more biking and visiting a dinosaur museum. Then we splashed out and flew back to the north of Laos to participate in something called The Gibbon Experience. But before we go into that, let us talk about Laos Airlines for a minute. So, most airlines now go by the handy ‘e-ticket’ idea, especially good for people like Seth, who like to leave tickets and things behind in guesthouses! Yup, underneath the flooring of our place in Don Det, someone is going to find some airline tickets which we were hiding for safety. Turns out we hid them a little too well – we totally forgot about them! I’m sort of off the hook because I was pretty sick, but I am not saying I would have remembered them even if I had been healthy. So at 4:30pm we went down to the Laos Aviation head office, where we had purchased the tickets in person two weeks previously, and tried to get replacement tickets for our flight at 9:30am the next morning. Apparently it was not going to be simple. At first, the woman helping us announced that we would have to get our guesthouse on Don Det to mail them to her by the next morning. Keep in mind Don Det has no phones or electricity. When we pointed out that her plan wasn’t going to work, she told us we had the 15 minutes until they closed to get a ‘police report’ or else we would have to repurchase the tickets. We went to the police office, and they sent us on a wild goose chase to 3 additional police and tourist stations. No one seemed to know what these mysterious ‘police reports’ should look like, or maybe they were just wanting to go home as it was now 5:30pm. Either way, we ended up solving the problem the ‘Laos’ way, by going back the next morning and padding the pockets of the Laos Airlines office with some counterfeit American dollars (we got them from the bank!) and being sent on our way with only minutes to spare. Three hours later we had travelled back to Houay Xai, a trip which would have taken us 26 hours by bus, and were ready to check into the Gibbon Experience. It is an ecotourism project which was started to help protect the Bokeo Forest in Laos from excessive logging and poaching, by introducing alternative ways to employ the local people. A French man decided to act on his childhood dream of living in treehouses, and created a network of 5 treehouses about 40 metres off the ground, a maze of hiking trails, and a bunch of ziplines up to 1km. long to travel around the jungle in style. The project is only in its infancy, and has been taking guests for under three years, but is a pretty incredible idea. It now pays a team of forest rangers with full arrest authority, and these rangers are the only paid forest staff in all of Laos. It also uses local food to feed the tourists, employs mainly local people as guides, cooks, and builders, and has a strong committment to avoiding ‘ethnotourism’, something Seth and I had a real problem with here in Southeast Asia. By ethnotourism, I mean the business of selling ‘authentic tribal culture’ to tourists as part of package treks. See the photo below for a sick example of this. Anyways, we went trekking and zipping in the jungle for three days, playing with monkeys and an orphaned baby bear, and watching the wildlife and natural world. Unfortunately we missed out on seeing the gibbons themselves because a huge storm came in while we were there, putting them into hiding. However, whatever excitement we missed out in not seeing the gibbons, we certainly gained riding out three thunderstorms 40 metres off the ground in a treehouse, trying to decide if the massive gusts of wind and lightening strikes were reason enough to evacuate down the metal ziplines to safety. We evacuated the first time, but as the second and third storms hit (in the middle of the night) we started to wonder if it was worth leaving a warm bed, and we became more used to the peals of thunder and rocking treehouse. Our guides told us to stay the second and third times, but were terrified enough themselves to evacuate. Needless to say, we were not impressed and I think the company will be doing some more evacuation drills with their guides in the very near future. In retrospect, I think the risk was probably pretty low, and the treehouse was safer than it felt, but it made for a very exciting and somewhat sleepless night. We are now back in Thailand, making our way south to the islands for some R&R before we fly home…in two weeks! See you all soon. This entry was posted on Wednesday, February 28th, 2007 at 3:30 am and is filed under Uncategorized. You can follow any responses to this entry through the RSS 2.0 feed. You can leave a response, or trackback from your own site. Hi Seth and Clear, I read on this site that you participated in the Gibbon Experience. I am really interested. How did you arrange this and how much did it cost? Was it worth it? In may i wanna go to Laos/Cambodia/Thailand for 2 months and this Experience sounds amazing. Can you tell me more about it ?